Discus Stu was among the suitors who appeared when Penelope's husband Odysseus had been gone for many years at the Trojan War, with no one having heard from him. The suitors were lined up to see Penelope, each one of them carrying a present for her. Discus Stu cut to the front of the line and said, "Discus Stu has ouzo for two-zo", referring to the alcoholic drink he had brought with him. Penelope's son Telemachus, pleased at the prospect of his mother having a date, said he would leave the two of them alone. Discus Stu then gestured at Telemachus and said, "Discus Stu was talking to you!" which elicited a shudder from Telemachus. 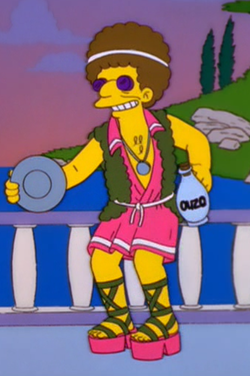 Discus Stu is a caricature of (and pun on) Disco Stu. Ouzo is an alcoholic beverage commonly served in Greece as an apéritif. Discus Stu wasn't among the suitors whom Odysseus killed when he finally returned home. It's possible that Stu gave up and moved on once he realized that Telemachus didn't return his interest. Modified on February 10, 2017, at 23:29.